Earth4 Energy Review – Is This The Real Deal? Home/Earth 4 Energy/Earth4 Energy Review – Is This The Real Deal? Does the Earth4 Energy e-book by Michael Harvey works? Will it help to reduce your home electricity bills? The key behind the Earth4 Energy guide is to teach you how to make a Do It Yourself (DIY) solar panel with minimal cost. A typical Photovoltaic (PV) panel consists of 36 PV cells capable of generating 18 volts of electricity at 75 watts. Joining a couple of solar panels together and you’ll be able to harness the free energy from the sun and use is to charge up a battery bank. The same battery bank can then be used to power some of your home electrical appliances and most of the lighting fixtures. How much would it cost to make a solar panel on your own? By following the instruction in Earth4 Energy, you can get it done with less than $150. The budget can get lower if you are willing to do some work sourcing for used or recycled solar cells. There is a disclaimer though. A homemade solar panel is not a difficult task. However, if you are not good with hand tools and you don’t know how to solder two pieces of wires together, the whole project can be very challenging for you. Imaging this….you have 36 pieces of PV cell and each cell has 2 tabbing wires. All the tabbing wires have to be soldered to each other to form a series of photo conducting cell. Therefore, you have to do more than 72 soldered wire joints! If you don’t feel comfortable handling hot iron rods or working with molten metal, it is fair to say making the DIY solar panel will not work for you. So what’s your alternative then? You can head over to Amazon.com and buy a readymade solar panel. To wrap up, is the Earth4 Energy guide by Michael Harvey the real deal? 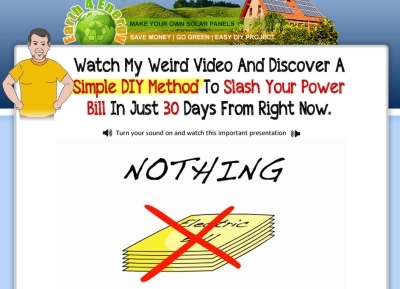 It will show you how to make a solar panel on your own with step by step instructional videos, but the rest is up to you. If you have patient and dedication, the DIY solar panel will supply sufficient power for your home solar power system. ==> Click here to visit Earth4 Energy now!